BioTuning Twin Tank Kits provide the very best parts at the best possible price. You get everything you need for a complete conversion, you just need to add the second fuel tank. The version 2 kit has our compact brazed plate heat exchanger , our Eckes heated filter and a pair of our 8mm 3 port solenoid valves for vegoil allowing the supply and return fuels to be switched independently thus minimising any cross-transfer of fuels between tanks during the purge cycle. 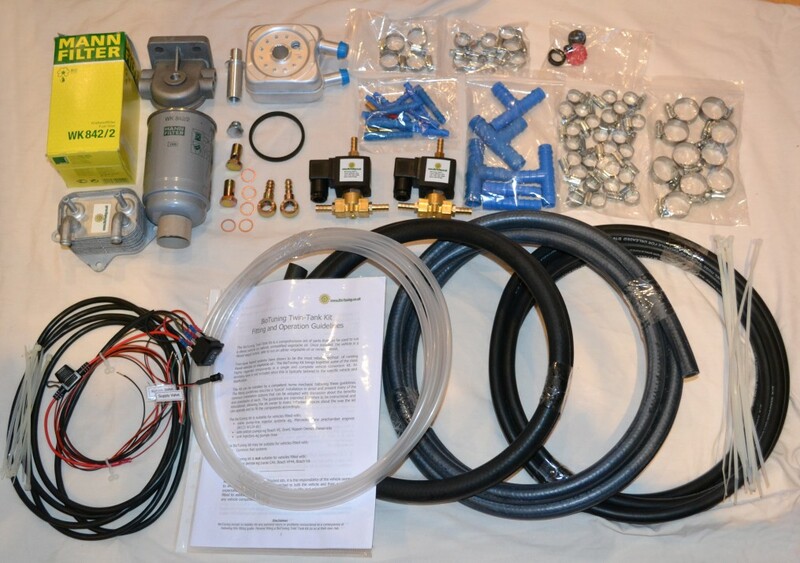 It is a complete set of parts that can be used to run a diesel vehicle on natural, unmodified vegetable oil. We no longer stock our compact heat exchanger so kits are now shipping with our powerful heat exchanger as standard. A pair of 8mm BioTuning solenoid fuel selector valves. Designed to our specification especially for fuel tank selection in twin tank vegoil conversions, they have significantly higher specification than any other 8mm solenoid valve on the market. A BioTuning compact aluminium brazed plate heat exchanger. Also specifically designed by us for vegetable oil conversions in cars and light vans. It has a fine array of baffles between each plate ensuring that the surface area in contact with the fluids is HUGE and inducing turbulence to ensure the heat is mixed throughout the oil. This provides the equivalent of more than ten metres of hose in hose and is far superior to glow plug heaters or metal blocks sold as heat exchangers. It is 50% larger than the similar plate heat exchangers used in other kits and has much more practically arranged hose fittings. An Eckes style heated fuel filter. A must-have component if you want to run on waste vegetable oil. It has a highly efficient, coolant based, brazed plate heat exchanger sandwiched between the filter head and the spin-on filter cartridge. This gets the fuel piping hot and makes filtering of biofuel much more efficient, relieving strain on the injector pump that would otherwise be caused by drawing cold viscous oil through the filter. We would never consider converting a vehicle without using a heated filter and consider it a requirement of any good vegoil conversion. Diesel mode. With the switch in the O position (0 valves powered) both the supply valve and the return valve are unenergised (off). The fuel is drawn from and returned to the diesel tank. The LED is off. 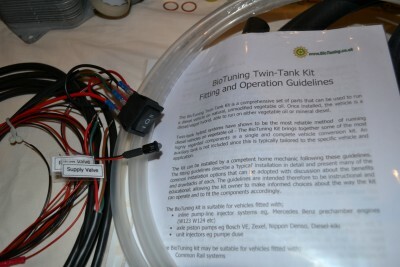 Operating the kit is as follows; Run the vehicle in the diesel mode until the engine is warm. Switch to veg mode when the engine has reached operating temperature. Run in this mode for the rest of the journey. If the vehicle will be left to cool down before the next journey a purge is necessary. Run the vehicle for around 60 seconds in purge mode and then switch to diesel mode and run for a further 30 seconds. The vehicle is primed and ready for the next cold start. All components in this BioTuning kit are high quality, reliable automotive specification parts with class 'A' vegoil materials compliance throughout. In addition to the three active components, the kit includes all fuel hose (SAEJ30R6) and coolant hose (SAEJ20R3) , hose connectors and hose clips, switch, wires, fuse holder, bi-colour indicator LED and fitting guidelines. See below for upgrade options. 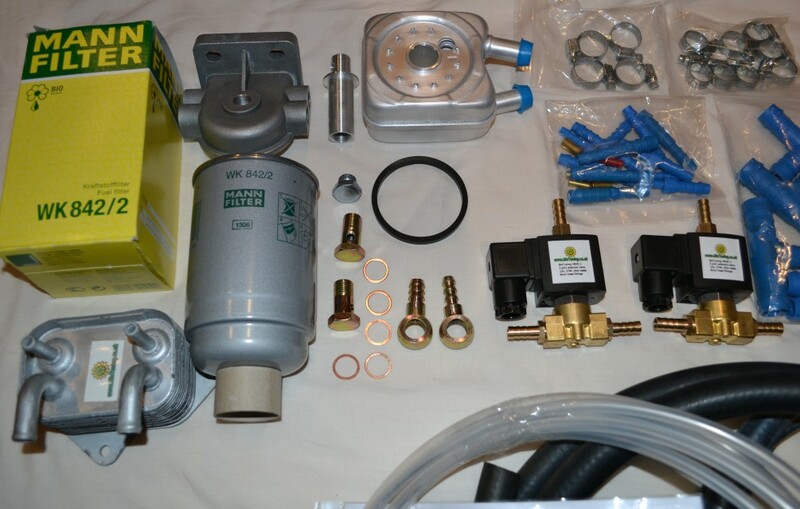 For larger vehicles, we offer options to upgrade the valves and heat exchanger in the standard verson 2 kit. Please use the buttons provided if you would like to upgrade your kit. If the valves are upgraded to 10mm versions, we will upgrade the fuel hose to 10mm along with the fuel fittings on the heated filter. If the heat exchanger is upgraded we will supply it with fittings to match those on the valves. Please note: you will need to buy a second tank in order to use our kit. It can be either a large tank to hold the vegoil or a smaller one for your start-up diesel. Our kits do not come with a second tank because vegoilers usually prefer to choose the size, shape and material of tank that suits their vehicle and circumstances. Our choice is not to add the cost of a generic tank to our kits so that you can spend the money on a tank you actually want!